Our choice for the best smoker is the Smoke Hollow 44241G2. We settled on this smoker based on its size and the sheer amounts of meat it can comfortably handle. It is a versatile device, containing grids for regular cooking, for making jerky, a rib rack, and a sausage hanger. Our step up pick is the Weber 721001 Smokey Mountain Cooker. At 18 inches, it does not have as large a capacity as our best smoker, but it has many redeeming qualities. These include the authentic smokehouse flavor of the meat it smokes, the heat-resistant nylon handle, the rust-resistant aluminum heat shield and the built-in thermometer. Our budget pick is the Camp Chef SMV185 Smoker. You can get it at a more affordable price than the other two. Despite its pocket friendly price, this unit enables you to control the internal temperatures and has two adjustable smoking racks, a jerky smoking rack, and an easy-to-clean removable porcelain base tray. The smoking process involves browning, flavoring, cooking or preserving food by exposing it to smoke emanating from smoldering or burning material (usually wood or charcoal). Examples of foods smoked often include fish, meat, and lapsang souchong tea. Many people confuse smokers with grills. They are not the same thing. They do the same job, but the result is not the same. The former give your meat a smoky flavor while the latter give it a grilled flavor. Smokers use charcoal, wood, gas, or electricity, as a source of fuel. Gas smokers and electric smokers are the easiest to use. On the other hand, the best thing about wood and charcoal smokers is their authentic “barbecue” flavor. Smokers are designed as follows: a wood chip basin and a water basin placed in the bottom of the smoker chamber. The water basin can contain either water or sand. While the wood gives the smoky flavor and produces the smoke, the water/sand ensures the internal temperature remains stable. They cook at different temperatures. A gas or charcoal grill can have an internal temperature as hot as 400 degrees Fahrenheit. Grills cook with direct heat, but smokers use indirect heat. The internal temperature of the latter ranges between 160 and 300 degrees Fahrenheit. At the lower temperatures, the device cooks cheese, fish, and vegetables. Meats smoke at 200 to 222 degrees. Though they may look similar, they have different internal designs. The design of grills is such that direct heat is applied to foods cooking on the grates. It doesn’t matter if you are using charcoal, gas, or electric – they always apply direct heat. As a result, they have shorter cooking times, which is one of the best qualities of grills. Conversely, smokers use indirect heat. Charcoal or wood devices vent heat into the cooking chamber from their fire chamber. The two devices also have different cooking techniques. Grilling requires you to turn your food a lot of times to ensure it doesn’t burn. This is because of the direct heat – it cooks food quickly, but it can also burn it, if you don’t turn it frequently. Smoking, on the other hand, does not need frequent turning of the food since it uses indirect heat. The smoking environment is similar to that of an oven. The best advantage of this slow cooking is that it lets the smoky flavor to better penetrate the food. One of the best advantages smoking has over grilling is that it is also a way of preserving foods. People were smoking and salting foods to preserve them long before the invention of refrigeration. You can preserve meats by hard-smoking them, which gives an end product similar to jerky. Such recipes tend to use a lot of smoke, with meats smoking at low temperatures to get rid of all the moisture. Smoking gives you more options than grilling: for instance, you can smoke cheese and you can make beef jerky by smoking. Thanks to their speedier cooking ability, grills are the best for cookouts. On the other hand, smoking produces the best flavor. Smoking is the best option for large cuts of meats: ribs, roasts, ham, and briskets, for instance. It is also the best for making jerky. Grills are the best option for small cuts of meat like steaks, chops, and chicken breasts. A propane smoker operates using a propane tank. They are some of the best and easiest to use since there are few fluctuations in the heating process. If parts break, it is easy to replace them since they are easily available in hardware stores as compared to some of the heating elements of electric smokers. The parts are also usually less expensive. One of their best features is their portability. You can use them anywhere. Therefore, they are a good option for camping. Meat smoking purists consider electric smoking, like gas smoking, a form of cheating, but it has its advantages. For instance, it is easy to maintain a constant temperature when you are working with an electric device. Like with propane smoking devices, some of the parts can break, particularly the electric units, necessitating replacement. They make it easy to maintain a consistent temperature. They consist of an auger system which feeds wood pellets into a stove, with a thermostat monitoring and informing the auger system the right time to add wood pellets. The best thing about wood pellets is that they consist of 100% wood, so you are still using wood to cook your food. A pellet smoker’s parts can break – the jamming/failure of the auger mechanisms. They are also rather pricey. Charcoal is the fuel source most beloved of purists. BBQ enthusiasts believe that charcoal smoking gives the best flavor. Unlike with other fuel sources, starting and maintaining a charcoal fire is a hassle. It is an art which one masters over time. Kamado-style smokers and grills are based on ancient Chinese and Japanese technology - the device was called “mushikamado”. The origin of modern Kamado smokers goes back to World War 2. After the war was over, U.S. troops were in Japan during the occupation period where they had to adapt to the country’s cooking customs and equipment. They converted rice cookers and used them to make barbecue – the result was the Kamado cooker. Modern Kamado devices are usually made of ceramics. The advantage of ceramics over other materials is superior heat retention. Such devices are therefore highly versatile – you can use them for smoking, grilling, as well as baking. Their distinguishing feature is their vertical design and cylindrical shape. Another name for them is water smokers. They can also be referred to as bullet smokers thanks to their shape. They comprise a fire tray below, a water pan above this, and a cooking space at the top. They have an access door for the addition of extra charcoal or water. You load food from the top. The water pan creates a humid cooking environment, which ensures your meat does not dry out. Vertical smokers are small and take up little space. They are also economical on fuel use as well as purchase price, which make them the best choice for anyone on a small budget. In addition, they are not complicated – just make the fire and fill the water pan. They consist of two distinct compartments: the cooking chamber and a smaller chamber known as the firebox. The firebox is attached to the cooking chamber. Smoke and heat are created in the firebox, and flow into the cooking chamber through a hole before going over the smokestack. We organized our selections according to fuel source: gas, electricity, pellets, and charcoal. Each best type of smoker had to be represented in our list of the best smokers. Other than the fuel source, we also classified our selections according to the other types of smokers: for instance, kamado, vertical, and offset firebox smoker. Size matters, especially if you regularly cook large amounts of meat/food, or if you often hold BBQ events with BBQ smokers for large groups of people. The best unit won’t just smoke. It also functions as a grill. Our best unit is the Smoke Hollow 44241G2 44-Inch Vertical Propane Smoker. It has a host of attractive features. It comes with two standard grids for cooking, two jerky grids, one rib rack, and one sausage hanger. It also comes with a dual door design that has a tempered glass viewing window. The dual stainless steel burners work independently, and give optimum performance and temperature control. The Smoke Hollow 44241G2 is one of the best options when you have a large gathering to cook for. Its cooking area has a capacity of 6.5 cubic feet. It is the best device for anyone who regularly smokes large quantities of meat. Other great features include a temperature gauge, two porcelain-coated wood chip pans that have lids, a large water pan coated with porcelain, push button ignition, and a smoke stack that is easy to adjust. It’s not exactly a flaw, but the large size may not appeal to everybody, especially if you are only cooking for your family. If that is the case, our step-up pick is a good option too. Our second best device is the Weber 721001 Smokey Mountain Cooler 18-Inch Charcoal Smoker. Charcoal smokers provide an authentic smokehouse flavor. It is constructed from steel enameled with porcelain, and has a heat-resistant nylon handle and rust-resistant aluminum heat shield. The Weber 721001 is not as large as our best smoker, having a measurement of approximately 21 by 19 by 41 inches. It has two nickel-plated cooking grates that are 18-1/2 inches wide and span a total area of 481 square inches. Other nice features include a built-in thermometer, water pan, storage cover, and individual vents on the bowl and lid. The best unit at an affordable price is the Camp Chef 18-Inch Smoker SMV185. With this device, you can inject the smoked flavor of cherry, mesquite, hickory, and so on into your meats. It cooks with the heat low and slow, using a heavy-gauge steel wood chip tray and water pan, infusing the meat with a delicious flavor. You can use it for a broad range of foods, including whole turkey, ribs, and baked pies. It comes with three damper valves, fully adjustable heat-control dials, and a door thermometer. You can control the internal temperatures during the cooking process. Cooking temperatures are variable – from 160 to 400 degrees Fahrenheit. The thermometer is easy to read and displays temperatures from 50 to 550 degrees. Some of its other features include convenient matchless snap-ignition, two adjustable smoking racks, one jerky smoking rack, a removable porcelain base tray that is easy to clean, and a protected burner drum to ensure maximum heat control. It also comes with recipes and cooking tips. Kamado devices are modern versions of Chinese earthenware cooking ovens. 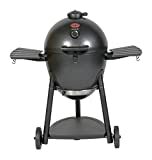 Our best is the Char-Griller 16620 Akorn Kamado Kooker Charcoal Barbecue Grill and Smoker. Its primary cooking space has an area of 314 square inches while the warming rack is 433 square inches, giving a total area of 447 square inches. Thanks to its insulated design, you will use less charcoal. The insulated heat ensures you enjoy juicy meat. The cooking surface is constructed from cast iron, with a 22-gauge steel body, and a powder-coated steel exterior finish. Its interior finish is made of porcelain-coated steel. Other features that make it the best in this category include easy dump ash pan, heat gauge, two folding black metal shelves, locking lead, and double-wall insulation. For the best gas smoker, we went with the Char-Broil Big Easy TRU-Infrared Smoker, Roaster, and Grill. This device stood out amongst gas smokers is great for smoking, roasting, and grilling food – a three-in-one combo. It comes with a feature known as TRU-Infrared technology that enables you to cook your food evenly while experiencing no flare ups. It will give you the best, evenly cooked ribs, turkey, roast, and other cuts of meat. It comes with a smoker box, which you use to add flavor. The internal smoker box operates using wood chips or pellets, and does not need air dampers or a messy water pan. Temperature control ranges between 9,000 and 18,000 BTU’s. The cooking basket can accommodate a turkey of up to 25 lbs for roasting. The grilling grate is made of stainless steel and has an area of 180 square inches. It does not require charcoal or oil. It has a propane burner between its outer and inner walls. The inner wall radiates infrared heat that penetrates your food in an even manner while sealing the juices inside. Hot air escapes out of the cooking chamber’s top before it can begin to dry out your food. As a result, your meat remains tender and moist with these gas smokers. Charcoal smokers are beloved because they give an authentic barbecue taste. Our best pick is the Weber 710220 Smokey Mountain. It has a porcelain-enameled water pan that adds steam, ensuring your meat retains its moistness and tenderness. The aluminum door is resistant to rust and has a spring-loaded latch that enables you to easily access the water pan and charcoal chamber. It has two cooking grates made of heavy duty steel which enable you to cook two things simultaneously. The built-in thermometer enables you to easily monitor the temperature control. The lid and bowl are made of premium-grade U.S. steel that is coated with porcelain enamel both on the inside and out. Our best vertical smoker is the Weber 731001 Smokey Mountain Cooker. It is constructed from porcelain-enameled steel and has a nylon handle that is resistant to heat. It also has a silicone temperature grommet. The unit measures 24 by 23 by 48-1/2 inches. The Weber 731001 cooks using charcoal, which means your meat will have that authentic barbecue flavor we all love. It has two 22-1/2-inch wide cooking grates that are nickel-plated that span a total area of 726 square inches. It also has a built-in thermometer, water pan, storage cover, and individual vents on the bowl and lid. Our best electric smoker is the Masterbuilt 20071117. The best advantage of electric smoking is the ease of use. 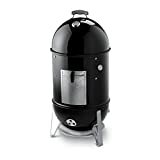 If you are a beginner to food smoking, this Masterbuilt electric model is the best option for you. All you have to do is plug it in and set its digital controls. With the electric digital panel, you can switch it on/off and control the temperature and the time. It also has an integrated thermostat temperature control to ensure consistent, even smoking. It has a fully-insulated body. The electric smoker can accommodate 6 whole chickens, 8 racks of ribs, 24 burgers, 64 sausages, 2 whole turkeys, or 4 pork butts. The patented pallet or side wood chip loading system enables you to load the electric smoker with wood chips without opening the door. 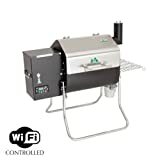 The best pellet smoker is the Green Mountain Grills Davy Crocket Pellet Grill. If you are tech-oriented, this is the best option for you since it is Wi-Fi-enabled. The digital Wi-Fi controller enables you to control and monitor the smoker on your phone. It also comes with Sense-Mate, which is a thermal sensor that carries out constant monitoring of the charcoal grill temperature. It runs on 12 V or 120 AC, making it ideal for activities such as camping, hunting, tail-gating, music festivals, house-boating, as well as regular home use. This unit is also one if the best options if you are looking for something portable. It weighs 57 pounds and has foldable legs, so you can easily fit in the trunk of your car. Other features include a meat probe, a peaked lid for stand-up chicken, open flame technology grease tray, and a convenience tray with utensil hooks. If you are looking for a device that acts as both a smoker and a charcoal grill, the Outdoor Leisure SH36208 40-Inch Barrel is your best option. You use the main chamber as a regular grill and smoke meat using the small offset firebox chamber. The offset method of smoking meat involves loading charcoal and wood into the pellet firebox and then placing meat into the main grilling chamber. The offset firebox in this particular offset smoker measures 20 by 18 inches. It is a barrel smoker, with a cooking area of 720 square inches, occupying a decent cooking space. It has heavy-duty cooking grids that are coated with porcelain. Smoking and grilling are among those activities that draw the raw passion of those who are enthusiastic about them. It was not easy for us to come up with this list of what we consider the best units. There are some better units, though they are quite pricey. We wanted to keep our smoker reviews in the price range that most people can afford. Apart from the extremely pricey units, the competition included other worthy units like the Masterbuilt Electric Smoker, Masterbuilt Smoker, Bee Smoker, Char-broil Electric Smoker and others which we considered unworthy. We left out some units because they are not easy to clean, break too easily, have parts that are difficult to replace, have cheap thermometers that are inaccurate, among other bad qualities. Q: What should I keep in mind when I am shopping for the best smoker? Materials and workmanship: The heavier the metal, the better. For instance, heavy steel will hold and distribute heat better than thin steel, a fact that becomes particularly pertinent in cold weather. Additionally, thick metal does not warp. The paint should be both waterproof and rust-proof. Examine the moving parts to determine if they will last. Heat distribution: The optimal situation is when temperatures are the same everywhere. It ensures that your meat is evenly cooked. Thermometer: Many cheap units use unreliable thermometers which can be off by as much as 50 degrees Fahrenheit. Insulation and seals: Examine the seals, insulations, welds, and thickness of the metal before you make the purchase. Cheap units leak heat and smoke, which makes it difficult to stabilize the temperatures or control the amount of smoke flavor. In this case, the quality of the food produced becomes unpredictable. Temperature range: The wider the range, the greater the variety of foods you can cook with your smoking device. Capacity: It depends on how many people you have in your regular cookouts. If you are only cooking for your small family, a smaller device is wise, but if you are looking for something to feed the extended family or to throw parties for your neighborhood, then you need a bigger unit. Footprint: How much space does the device take up? A bullet-shaped smoker will eat up about 3 by 3 feet, which makes it an ideal fit for the balcony. Compare this with horizontal offset firebox smokers, which gobble 9 by 4 feet. Always ensure that there is a lot of space around your unit – and good ventilation in the room. Look for units that are tall enough for turkeys (up to 1 foot) and wide enough for slabs of ribs as long as 16 inches. Look for a unit that has wheels for easier movement or pushing around when you want to relocate the unit. Can it also function as a smoker grill? Can it roast? What accessories does it have – for instance, a cookbook, cover, tool hooks, and rib hooks. What kind of customer support do you get? Carry out some research on the dealer’s reputation. Check out their website. Take a look at the manual to see how helpful it is. Carry out research to find out whether you will be able to replace parts in case of breakage. Q: What should I do to maintain my smoker? When the smoking device is new, fire it up without food when you first use it. This will burn off any manufacturing residue. It’s also a way of getting used to it. Larger ones may require seasoning. Check your manual for instructions. Seasoning procedure: Coat the inside surface with cooking oil, peanut oil, bacon grease, or some other type of oil. Heat the oil so that it penetrates any imperfect places on the metal surface. As a result, there will be a barrier to repel water and prevent your smoking device from rusting. Heat the device to a temperature of between 250 and 275 degrees. Higher than that will damage the paint. If the device does not require seasoning, still do fire it up once before you start smoking so as to heat the metal to a temperature above 250 degrees Fahrenheit. Doing so will get rid of any contamination. Ensure there is enough ventilation to prevent formation of a creosote layer. This is a substance that piles up in poorly ventilated smokers. Get rid of ashes and food build up in the device. However, you should not scrub the smoker down to the metal since you want to maintain the oiliness and smokiness of the surface for rust prevention. You get rid of ash because it absorbs oil and water, thus causing rust in the firebox. Scrape off any large deposits of grease for the same reason. While cleaning the device, examine it closely for signs of rust. You must act on rust immediately after you discover it. You can scrub it off using a wire brush or sandpaper. After that, clean the area and repaint it using rust-resistant “barbecue” paint. Q: How do I clean my smoker? Plastic tarp to protect your work area. Good cleaner/degreaser. Stainless steel devices may require special cleaners. Procedure: We will describe the procedure involved according to three different types of smokers. Q: How do I clean an offset? A: The instructions we give here are for a device that has no electric or digital smoker components. Pull on a pair of rubber gloves, and spread out the tarp to show your work area. Place the smoking device on the tarp, after having removed any unspent fuel from its cook chamber. Pour hot water into a plastic tub until it is full. Add a dish soap or cleaner of your choice to the hot water. Work on the grates with a grill brush. If the grates are porcelain-coated, use a brass-bristled brush to ensure you don’t nick them in the process. Immerse and soak in the tub. Scrape and brush its heat diffuser plate. Unscrew the chimney dome, and immerse it together with the diffuser plate in the tub of hot, soapy water. Work on the inside of the chimney with a long-handled wooden spoon or a paint-stirring stick. Use a putty knife or paint scrape to work on the inside lid of the firebox and cook chamber. Ensure you loosen any pools of grease or carbonized food that are in the bottom and use paper towels to wipe after you are done. You should also scrape the bottom half of the cook chamber, especially in the corners. Work on the grease gutter with your paint-stirring stick. Use the wet/dry vacuum to vacuum the loose debris and ash. Take out the grease catcher and clean off any drippings, after which you should immerse the grease catcher in the tub as well. Work with hot water to hose out the cook chamber, the firebox, and the outside surfaces of the smoker. If you have a pressure washer, that is even better. If there is any stubborn debris that won’t come off, use a degreaser and a scrubby. Wipe off the gasket. Work with rags or paper towels to dry out and absorb any excess water. Keep all the lids and vents opens and give the device some time to air-dry. If it looks rusty, work on it with steel wool or sandpaper, prime it, and spray with a quality, high-temperature paint. Scrub the parts that you have soaked in the tub of soapy water, after which you should give them time to air-dry. Put back the parts where they belong in or on the device. Use vegetable oil to oil the inside and the external area of the device. You should also lubricate the vents if they are sticky. To ensure easy clean-up, line the grease bucket with heavy-duty aluminum foil, which you should replace after every use. After smoking, work on the rack with a grill brush until it is clean. Do this when the smoker is barely warm to the touch: scrape out any grease that has built up in the smoke chamber’s bottom. Empty out the drip pan or grease bucket. Use a damp rag to wipe off the gasket surrounding the lid. Do this when the grill is completely cold: empty out and remove all ash. Every now and then scrape off scale which builds up on the inside of the lid. You don’t want it to end up in your food. Re-oil the smoker now and then to avoid occurrence of rust. Q: How do I clean my pellet smoker? Always keep the inside of your pellet smoker dry. The electronics are sensitive to moisture. Plus, the pellets begin to disintegrate when they get wet and can even jam up the augur. When you are cleaning the device, ensure its cooker is completely cold. Fill a plastic tub with hot water and cleaner or dish soap. Put the grill rack in the water, and the chimney dome as well. Get rid of any foil on the drip pan and flame detector. Brush off any debris. If they are particularly dirty, add to the tub. Get rid of any solids in the grease bucket and add to the tub. Do a proper scrub job on all the parts, and afterward allow them to air-dry. Work on the grease shoot with a long-handled wooden spoon or a paint-stirring stick. Use the same to scrape the inside of the chimney, where a lot of gunk tends to accumulate. Attach a dump scrubby to the end of the long spoon with rubber bands and work on the inside of the chimney. Work also on the inside of the lid to get rid of any soot flakes that have formed on it. Work with a shop-type vacuum to vacuum out the device’s interior, the firepot included. Ensure the holes in the firepot’s side are clear. Clean the interior with a slightly damp rag or scrubby which you have sprayed with a cleaner. After this, wipe the temperature probe, but do it with care. The probe is typically located on the cook chamber’s left hand side. Use a fresh damp scrubby to wipe down the exterior surface. If there are any stainless steel parts, work on them with stainless steel polish. If there are any powder-coated parts, finish them with auto wax. Coat the drip pan with heavy-duty aluminum foil. Put back the parts where they belong. Hang the grease bucket from its hook. Allow the device to run on High for approximately 10 minutes. After this, work on the grill gate with a brass-bristled brush. Cool down the smoking device by turning it off. Take the grease bucket off its hook and stow it where animals can’t reach it while you are working. Use a damp rag to clean off any drips on the exterior surface. After the grill has completely cooled (the next day), replace the foil on the drip pan, if it needs replacing, so as to prevent a grease fire. When you spot any peeling paint, treat immediately to protect your unit from rust. Q: How do I clean my electric cabinet smoker? Ensure the electronics inside the unit don’t get wet. Read the manual before you start cleaning. Allow the unit to cool completely before you start cleaning. You can clean the drip pan, racks, and water bowl in hot soapy water after each use. Let them air-dry completely. Empty out the smoker box and work on it with a damp cloth, but do not put in water. Work on the unit now and then with soft bristle brush to remove any loose bits of food, debris, or ash, which you then sweep out. Work on the metal walls (not the glass front) of the interior with a damp sponge. Work on the glass front with a damp sponge. Use the damp sponge to clean the exterior surfaces as well. Another great way of cleaning your electric smoker is to run it with a mixture of vinegar or lemon juice and water in the water pan till the interior steams. That should take about an hour. After that, let the electric unit cool down, after which you should wipe the interior surfaces to get rid of any smoky residue. Leave the door propped open to give the unit time to air-dry completely. Put back the parts where they should be. Q: At what temperatures should I cook different foods? Our best smoker is the Smoke Hollow 44241G2, which is a propane smokerf. We chose it especially because of its large size and large capacity. We consider it the best choice for anyone that has a big gathering of people coming to a cookout.